I often hear complains of Bluetooth on Linux and how it just doesn’t work well. I scratch my head as I just don’t understand the problem because I just cannot relate at all. Bluetooth in Linux has been a breeze! I don’t know if it is universally this easy with KDE Plasma or the way openSUSE packages it all together but of any Bluetooth enabled device I have ever used, KDE Plasma on openSUSE does it right. Adding the audio device in KDE is as easy as it is on an Android phone and more stable than my Chromebook. I have this CoolVox Kitchen Sound System as a part of my Whirlpool 5-Door refrigerator in my kitchen. It is a great sound system that I like to connect my tablet or laptop to listen to music or podcasts. There certainly is a “cool factor” in my refrigerator sound system. Adding any Bluetooth device I have ever purchased has been easy with KDE Plasma and has been since the KDE3 days though it is more stable today than ever. I have never had an issue with Bluetooth keyboards or mice but only in the last 3 years or so have purchased any Bluetooth audio devices. 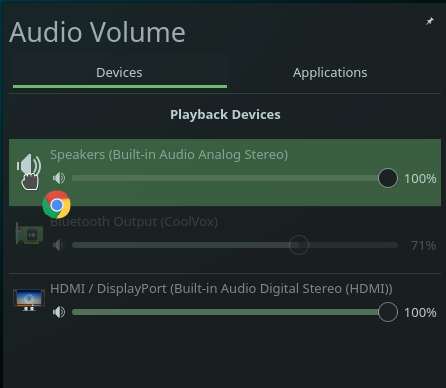 After you pair the audio device, KDE automatically recognizes it as such and makes it available for use immediately. The default setting with my install of KDE is to NOT automatically switch running streams to a new output. That can be changed in SystemSettings > Multimedia > Audio Volume under the Configuration Tab. I prefer to not have it automatically switch. I like my system notifications to stay on the internal speaker system. When there is an audio device available, Bluetooth or otherwise, it shows up right in the system tray audio control application. You can control the output of each device as you desire. It is a very straightforward and intuitive representation of your Playback (output) Devices as well as any Capture (input) Devices. I just have the built-in internal microphone / input device hooked up at this time. The Applications tab will display what applications are actively Streaming Audio. Further fine control of levels can be adjusted from here. I find it to be a great feature to be able to just mute a stream. This is a nicely polished interface that gives you a snapshot of what has made a connection to the PulseAudio sound system. Nine years ago, the PulseAudio / sound server systems were somewhat of a mess but today, things are pretty tip-top. 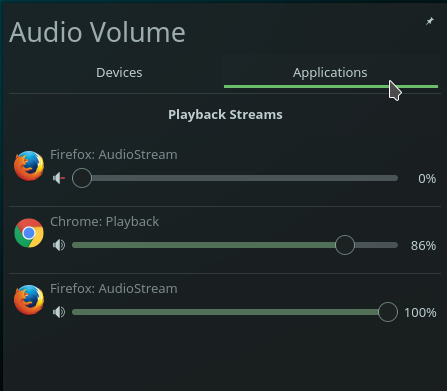 Here is the part that I think is really slick: If I want to move and audio stream to a different device, it is as simple as clicking it and dragging it to a different output. In this case pictured, going from my Coolvox Bluetooth speaker system to the internal speakers. To change it back, same procedure, select, drag and drop. I wish Android has such a convenient audio stream control mechanism. It really is crazy-awesome easy to use Bluetooth and has been stable to the point of forgetting that there was ever an issue with Bluetooth or Audio in Linux. 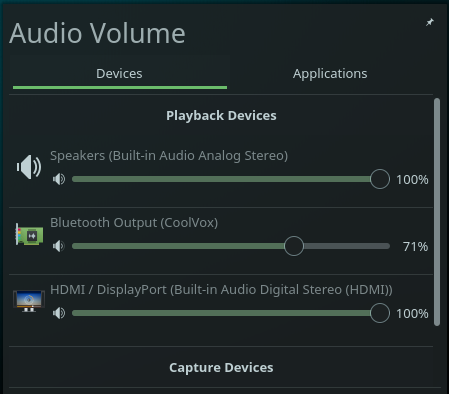 Even though I have heard recently heard that Bluetooth is a mess in Linux, it is certainly not the case with KDE Plasma on openSUSE Linux, with either Tumbleweed or Leap, nor has it been for quite a while. Other Desktop Environments or Distributions of Linux may struggle with Bluetooth on Linux, but that has not been my experience at all, for years. I hope that more Linux users can have a similar experience as I have had on KDE Plasma. Whether that is switching distributions, desktop environments or programming similar features into their desktop of choice and raising bar in one more area of the Linux Desktop. Bluetooth loves openSUSE Linux with KDE Plasma and that is fantastic!